Designed by Daniel Z. Bombigher in 1976, she was built by Roger Landry and Anna Alexandruk in St. Gabriel de Brandon, Quebec, in 1991-1996 and featured in Cruising World in February 1999 (sorry for the dark photos). She is a fully wooden schooner, cold-molded, complete with wooden blocks and classic lines. We call her our own small pirate ship. Arghh! Thaleïa is derived from the Greek meaning “to blossom” In ancient Greek mythology Thaleïa (or Thalia) was one of the nine Muses, the goddesses of music, song and dance. 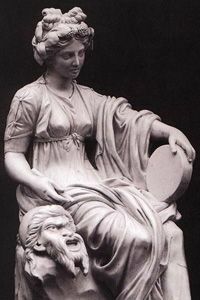 In Classical times, when the Muses were assigned specific artistic and literary spheres, Thaleïa was named Muse of comedy and idyllic poetry, and portrayed holding a comic mask, or a shepherd’s staff or wreath of ivy. Thaleïa/Thalia is also the name of one of the Three Graces. The Grace Thalia was the goddess of banquets and other festivities. In this context, her name means “rich” or “abundant”. The name is still in use in modern Greece. In the Greek alphabet it is written ‘theta- alpha- lambda- epsilon-iota- alpha’, with the accent on the first alpha.